The TEV Coordinating Group were joined yesterday by Liz Etheridge of Wychavon District Council and Becky Lashley of Worcestershire County Council. Liz and Becky have worked tirelessly over the last two years pulling together a Heritage Lottery Fund bid for a major project for the Vale Landscape Heritage Partnership. 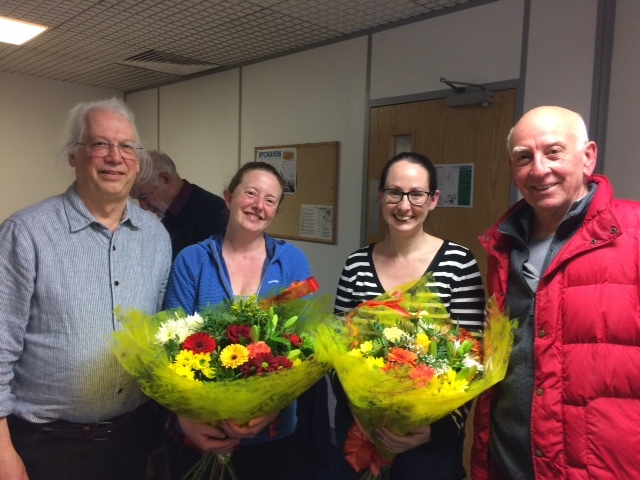 Liz and Becky were presented with bouquets of flowers by new TEV Chair Chris Haynes and retiring Chair Steve Martin. Although the HLF bid was unsuccessful this time, it was agreed to continue with the planned ‘Growing the Evesham Way’ project and we will be meeting to discuss alternative funding sources. Next post: Get Drastic with Plastic!